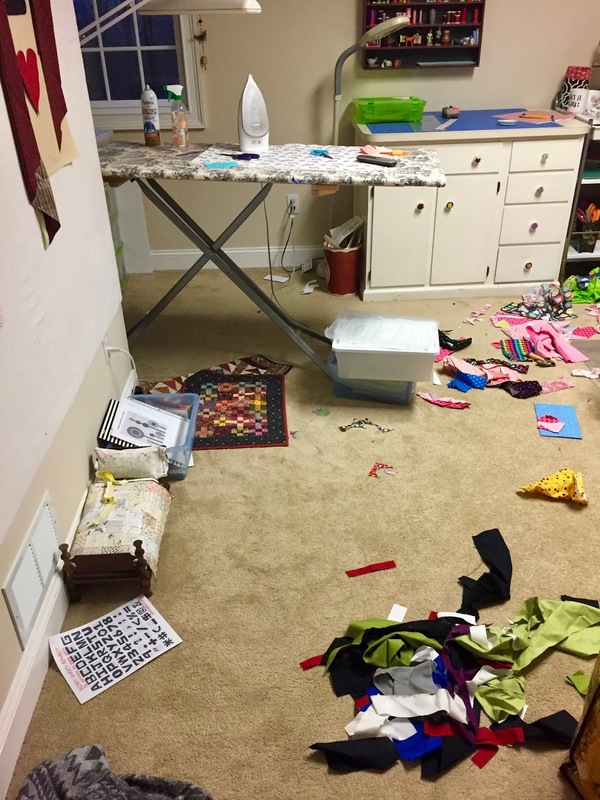 I know a messy sewing room is one that's been used and creative! Great tutorial!! I'm not a fan of glue, but I can see how helpful it is using your method. I thought it was very helpful and it is always good to see alternative methods!! I found the tutorial informative. Will give it a try! 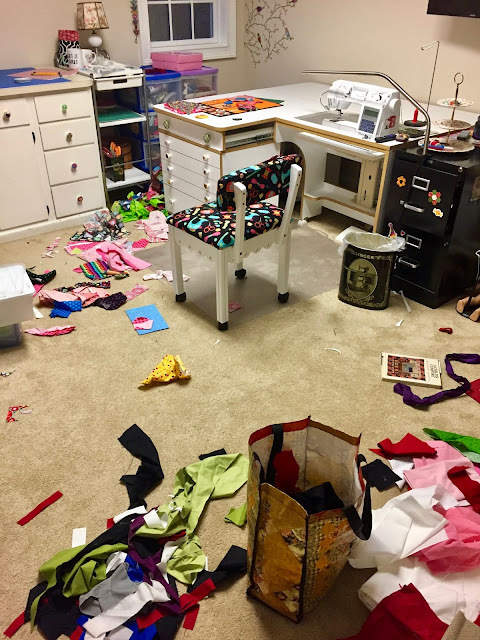 First of all, if you call that messy, I will NEVER be able to show my sewing room in its normal state of confusion! (although I must say I do not currently have a dead doll on the floor!). I found your tutorial extremely helpful and easy to understand. 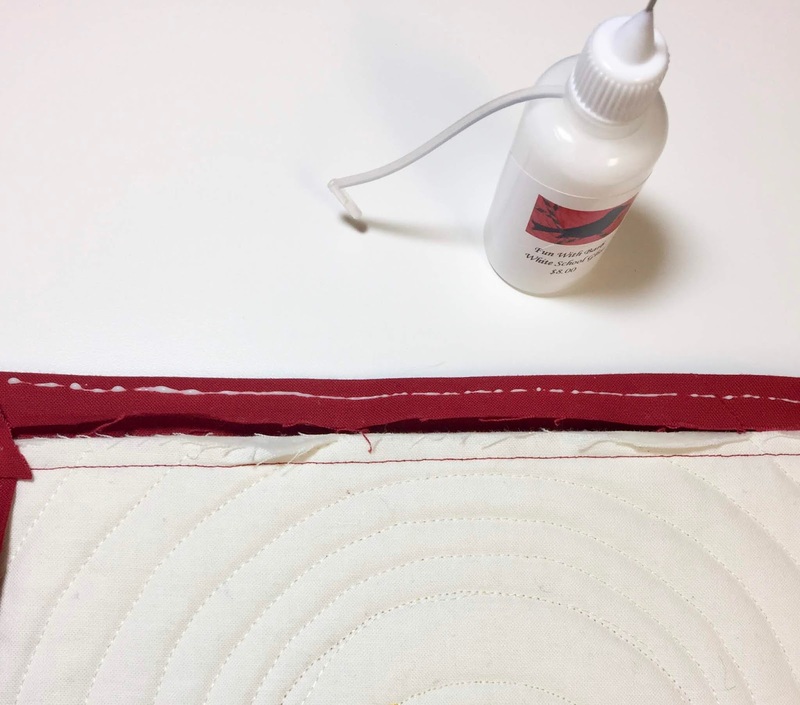 I have never used glue for anything in my quilting. I say it is because I am a traditionalist, but in truth it is because I am lazy and don't want to add one more step. But, I am willing to try something new! Wonderful! Very clear instructions. 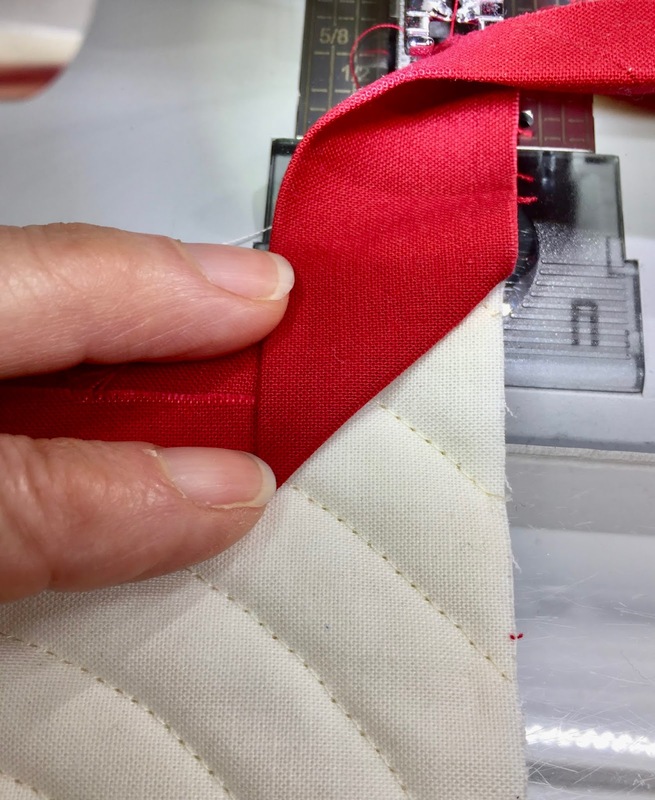 Do you join strips on the bias for larger pieces? Your tutorials are always so enjoyable, thorough, and doable. 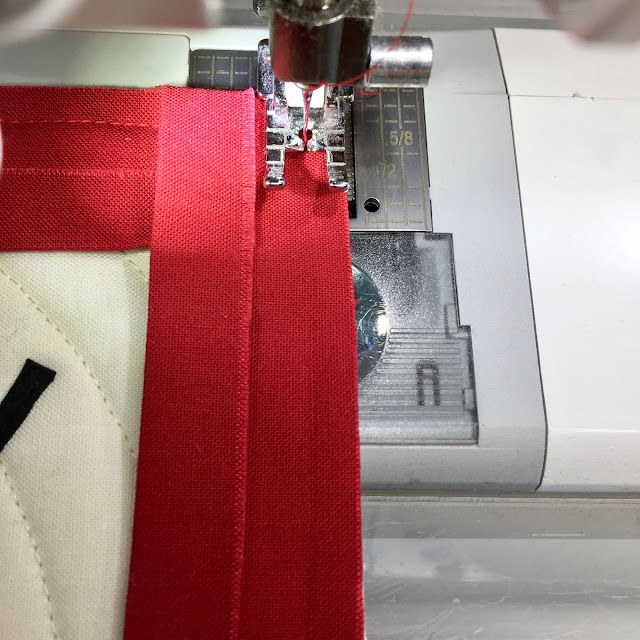 I have never done the single fold binding method, but, after reading your tutorial I am going to try this method now! 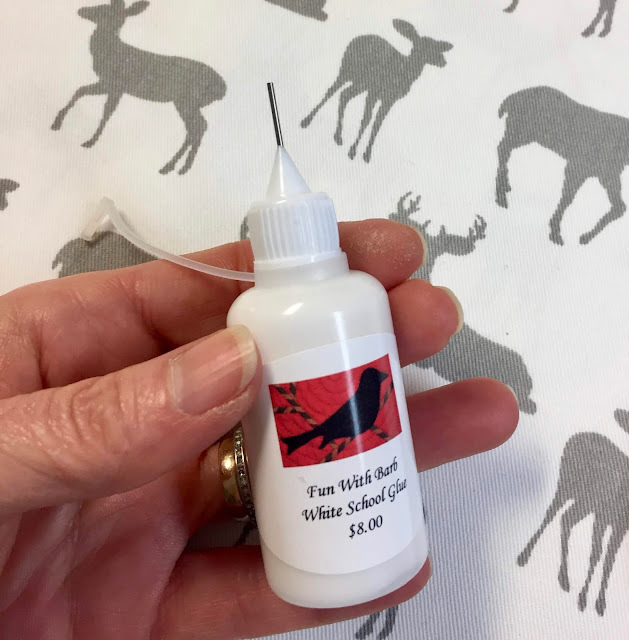 The micro tip on the glue has to be of great benefit! Thanks for sharing your talents with us Barb! Thanks for the tutorial. I've tried using single fold binding a couple of time...both were okay. I just finished a squirrel mini last night with nine 1.5 inch broken dish blocks - I'll use your tutorial for the binding. Thank you for this wonderful tutorial !! I'm not a big fan of glue because I have more glue on my fingers instead of the fabric !! ah ah !! But I'm going to try this method !! Happy Friday Barb ! I always use single binding for small quilts and plan to try your method of starting at the corner. That would make it a lot easier. 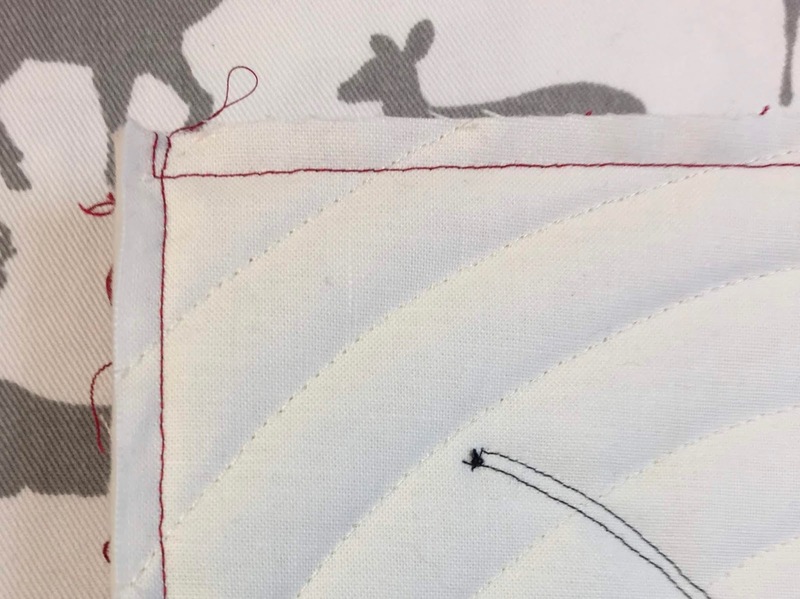 Yesterday I was binding a few small quilts and had trouble on 2 of them getting the closing seam to come out right. What a pain! I may have to remove some of the binding on one and redo it. 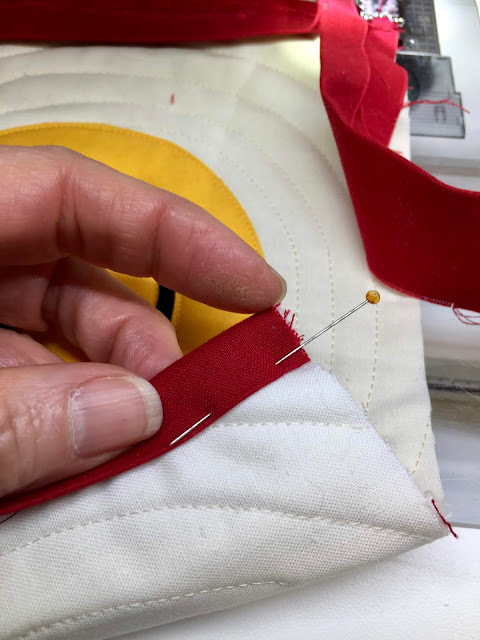 I have only used glue for applique so I am interested in trying your method. Thanks for this tutorial! I’m looking forward to trying it on a doll quilt. I’m especially interested to see how that beginning/ending corner works out! Thank you for the tutorial, Barb. 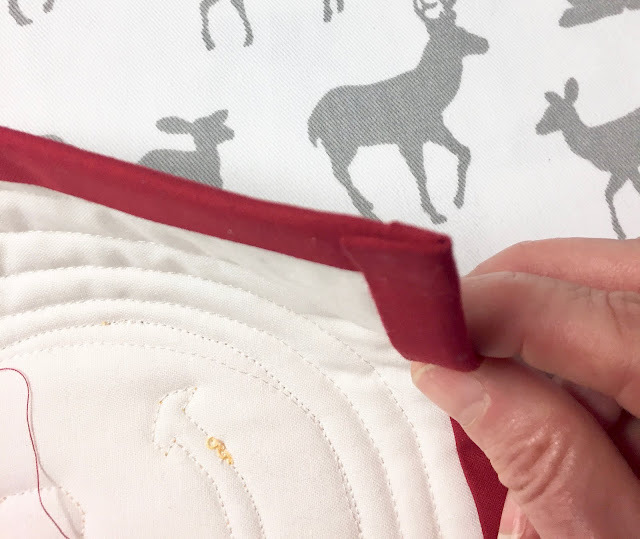 I've never used a single fold binding -- I don't usually make small quilts -- but when I do, I'll give your method a try. I have one question, though. 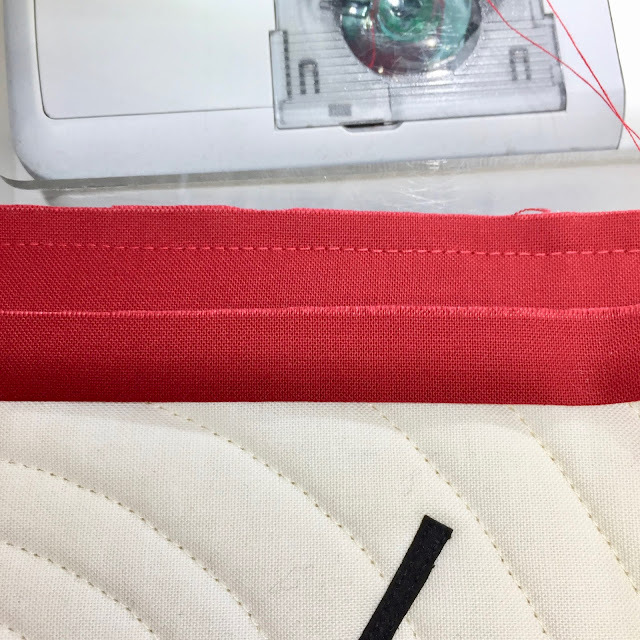 It seems like cutting a narrower strip for the binding would work if you're sewing a 1/4" seam but I'm sure there's a reason why you cut the binding strip wider. My question is this: when you find the binding to the back does it end up wider than 1/4"? Is it closer to 3/8"? 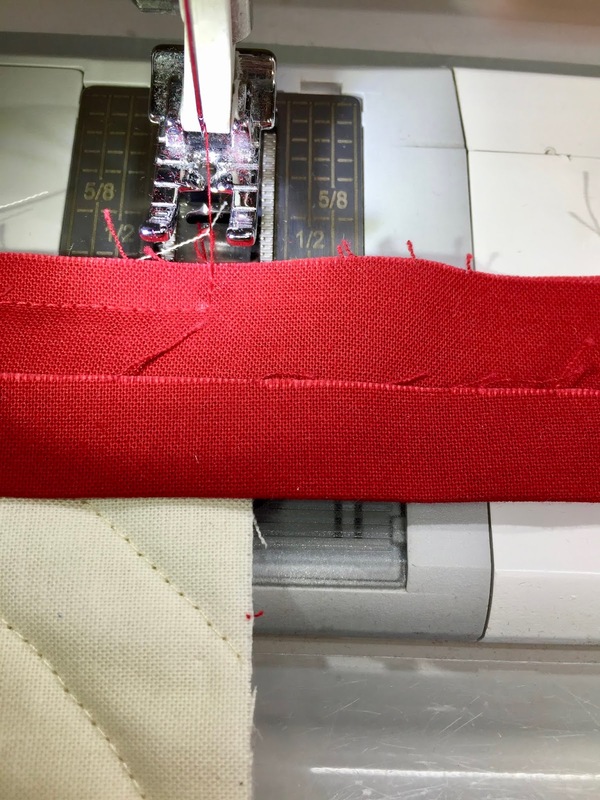 I love the disarray of seeing pieces of fabric scattered here and there in sewing rooms. They speak to me of energy and all the creativity that's going on in them! Good tips, Barb! 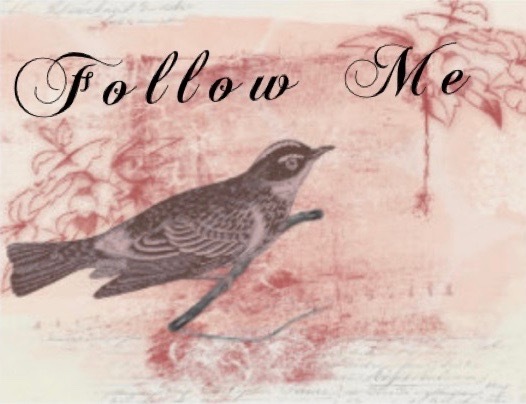 I always like seeing other people's spaces in a creative whirlwind! Thanks for sharing your single binding method. It looks very nice when finished. I'll be sure to keep this post for reference. I usually do double fold binding, but I do like the look of this on small quilts that won't get much handling. 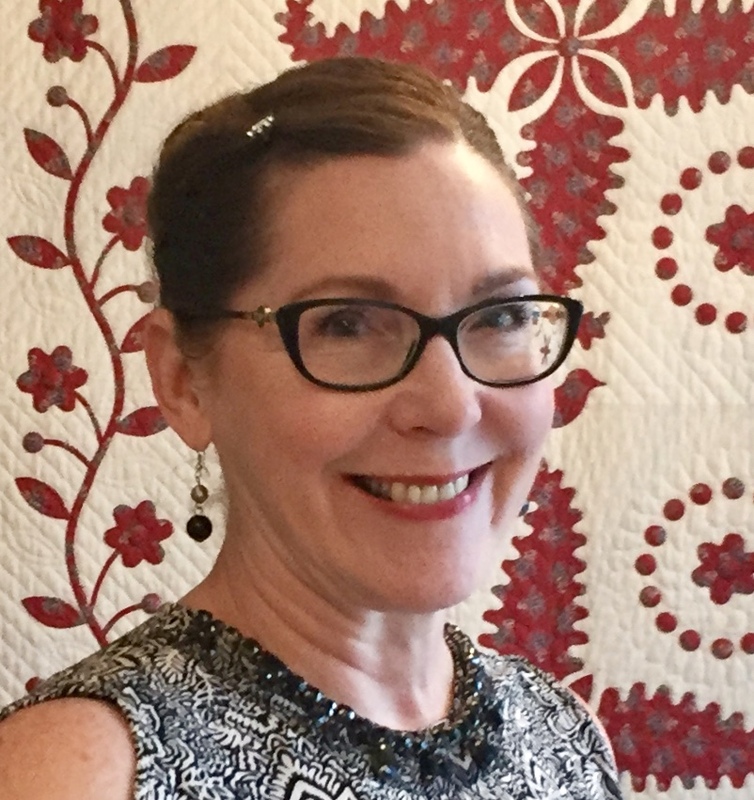 I'll looking forward to seeing you at my guild (Crazy Quilters) in March. Thanks for the giveaway. 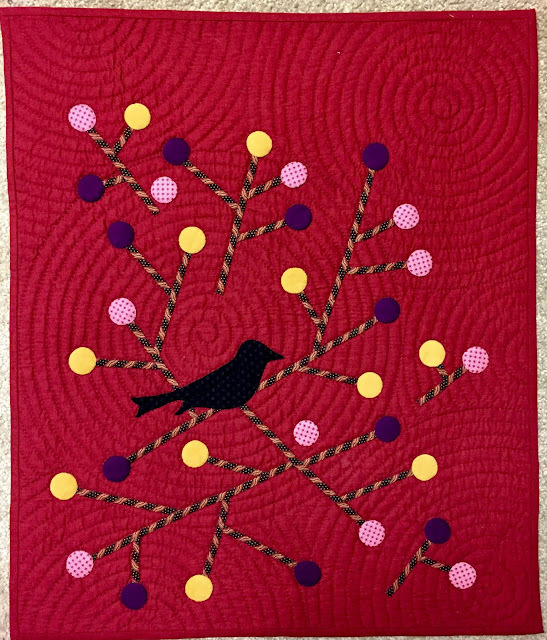 I love to make small wall quilts and your tutorial is perfect. 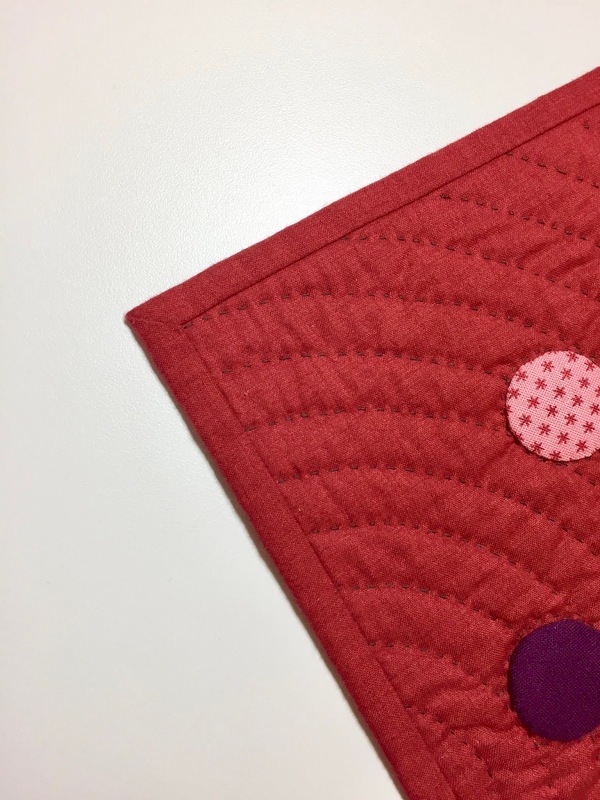 I haven't been happy with my double fold bindings on small projects, so I know I'll use your tutorial (which is perfectly done). I've never used glue for bindings, and its time I gave it a try. Thanks very much for thinking of your readers. I have never seen a binding done this way. Thanks for the tutorial! I am with Coco, where is the snow this winter? Oh and I just retired, so more time to play in my sewing room. Great step-by-step tutorial. I appreciate the tips to press over 1/2 inch, ending at a corner, and then glue basting to hold in place. Thanks. Nice tute! It does give a very smooth finish! Personally, I enjoy piecing the binding seam so I start in the middle of a side. Messy room equals happy quilter! Love seeing your creative space!! I haven't actually done a single binding, but I've thought about it for some of the small quilts I've done. I just get in the habit of doing it the way I've done it for years. Time for an old dog to try a new trick. Great tutorial Barb! I have always loved that bird quilt and seeing it on your header. Break with Coco was cute! My sewing space is also a total mess but good things are happening there so I am happy. I have never tried a single binding; I have not used glue for binding either. Ready to give this a try. Thanks Carol I hope you do! I did find it informative and will try it on my next small quilt. Just taught a binding class tonight and we discussed using a thinner binding on small quilts. Thanks Meredith for the nice comments. I hope you give it a try. 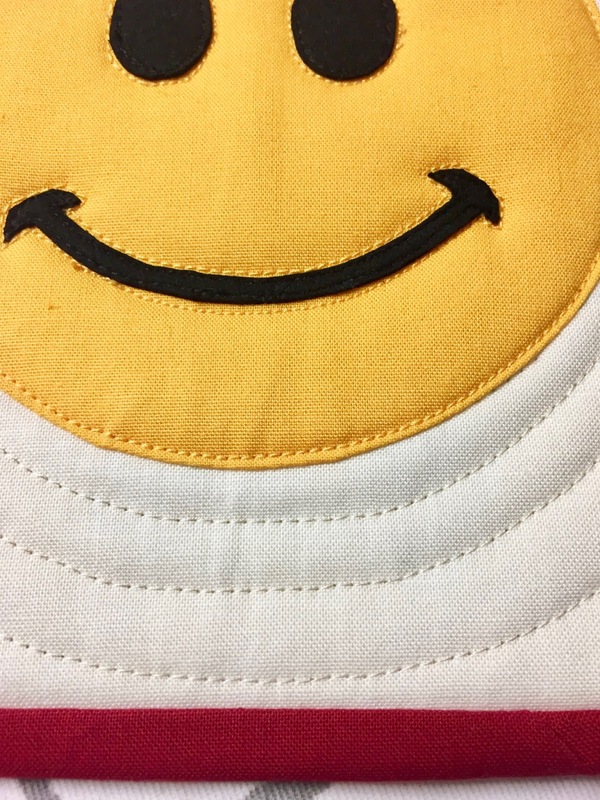 I tried making a smaller width binding on a mini, but it wasn't great! I can't wait to try this wonderful tut! 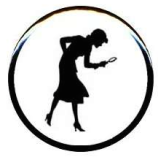 Thank you, Barb! Thanks Jean - wish I had your email to respond. Thanks for a great tutorial, Barb! I can't wait to try your method! Snow? What snow?? Your sewing room looks like mine did a couple of weeks ago, lol! There's still hope :) Have fun this weekend! Great tute! 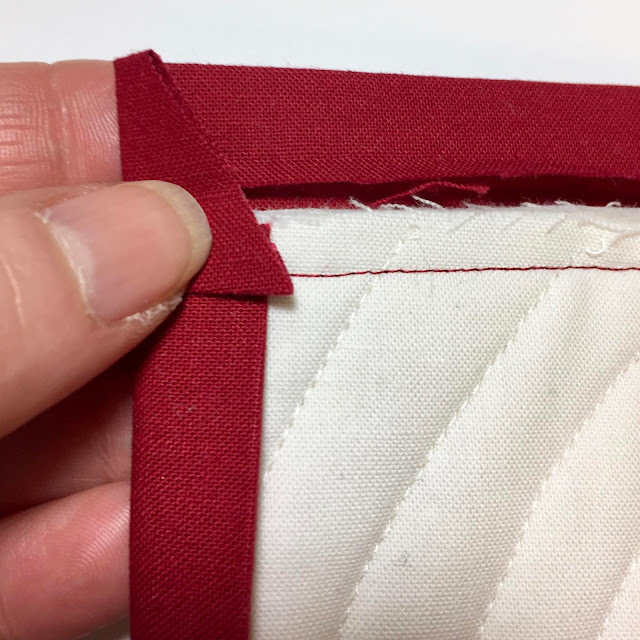 I learned doing a single binding a few years ago from a friend--I agree with you that it makes all the difference on a small quilt. My sewing room could use a good cleaning too--I feel your pain--lol! It's always good to learn new ways to bind! Thanks! I've pinned this post so I can refer back to it when I finish my next mini. I made pot holders at Christmas time, and sure could have used it then... and tell Coco she needs to go to Seattle. My son told me that the had 4 inches last night, that was going up to around 7 or 8. Personally, he and Coco can have all the snow! 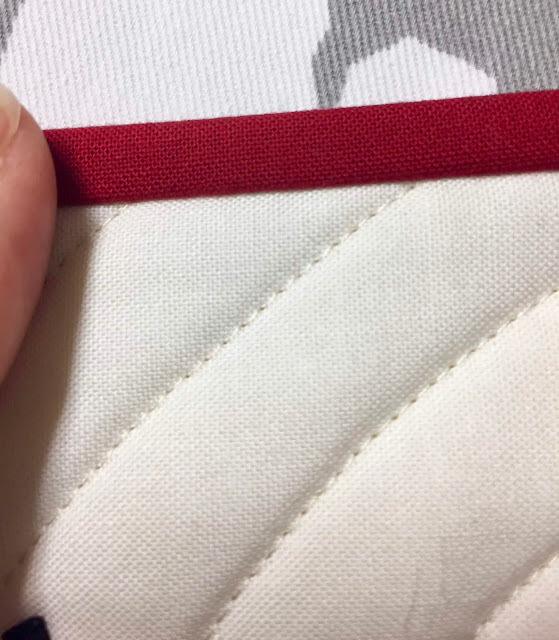 I love single binding for small quilts. Your method is intriguing and I will definitely try it on my next small finish. Thanks for the tutorial. I will try the single binding on a small wallhanging. If you enter your quilt to be judged in a show I’m surprised that the judge wouldn’t comment on three mitered corners and one not. Thanks for the tutorial. Yes this tutorial is useful. I haven't tried single fold binding but always wanted to try. Not having to join seams makes this technique even more intriguing now! As a former Science guy this looks to me like a “Creativity Overload Explosion”. Luckily your room sucked the power out of the implosion part and made the Explosion!!!!! Made me smile. In Florida I have such a tiny stash and sewing area I can only create teeny tiny creative explosions. I need to use this method for binding small items, I love how nice and smooth the binding lays using the single binding. I could never show anyone my sewing room right now.It is in dire need of a complete clean up. I liked the tutorial. And will give it a try. 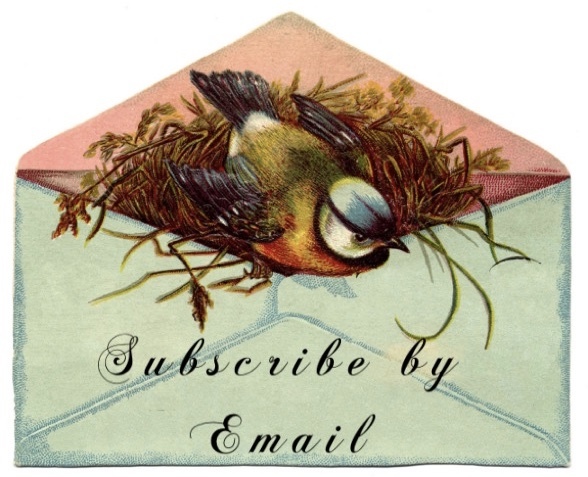 I always read your blog and look forward to a post. I don't always comment. I am not commenting because of the giveaway. I wanted to say this is fabulous!!!!! I'm a rule breaker at heart... I've never liked how I was taught to do binding... perhaps you should make a ruler/tool?!?! 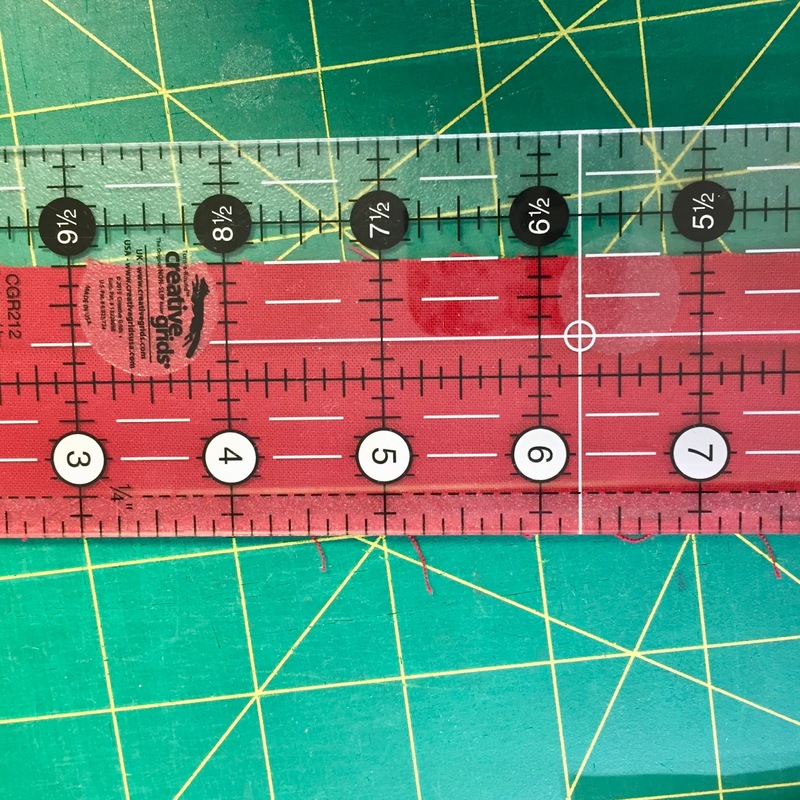 May sound silly and simple and not needed to you... but, look at all the useless rulers we've all purchased and they are still making them !!! And we're still buying them! This would be a simple one that you could grab and not have all those lines etc - - a binding ruler. Thanks, Barb! I'll definitely be giving this a try! 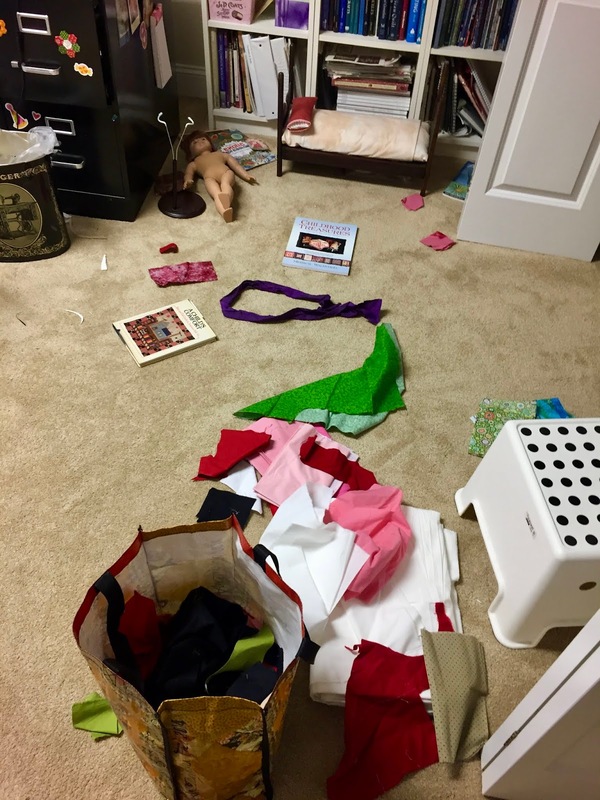 Looks like a tornado hit your sewing room. But I just know so much fun was had during the process that it is no big deal. Thank you so much for that tutorial. I see what I've been doing wrong! 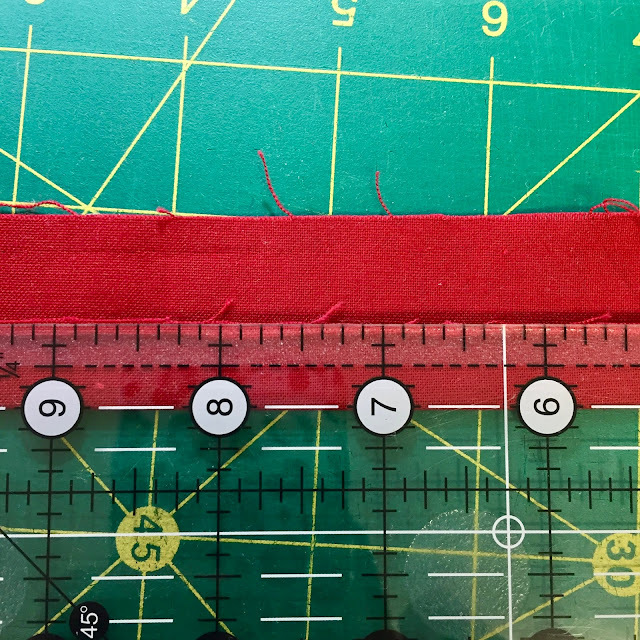 I've been cutting the binding at 1 1/2" not 1 3/4". Will change that with the next little quilt. I understand your sewing room disaster storm. 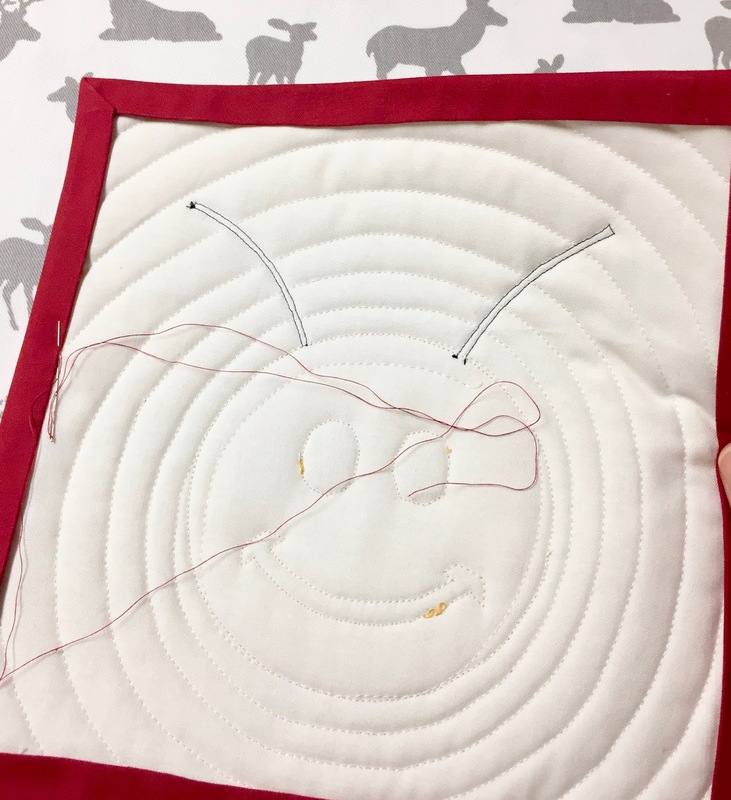 Do not feel badly quilting can get messy. 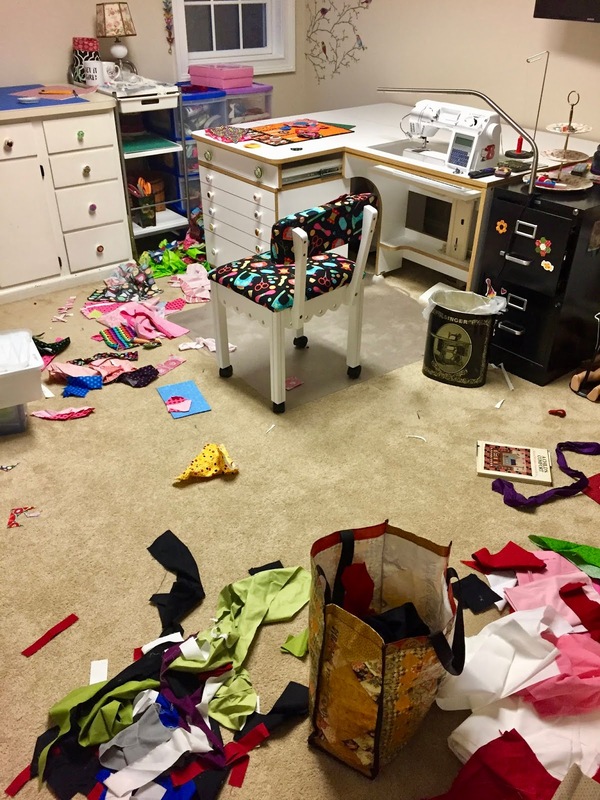 And as far as the mess in your sewing room, I am not one to judge. Let's just leave it at that. 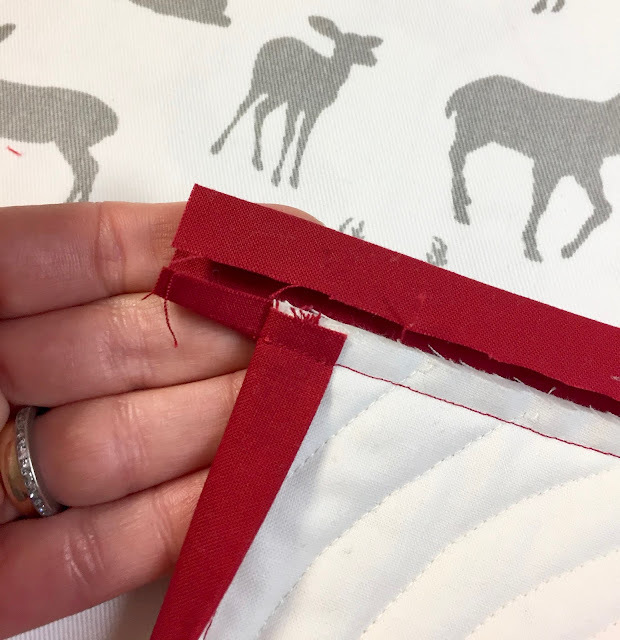 Great tutorial and you're right, a small binding looks so much better on little quilts. A messy sewing room is the sign of a busy and creative quilter! 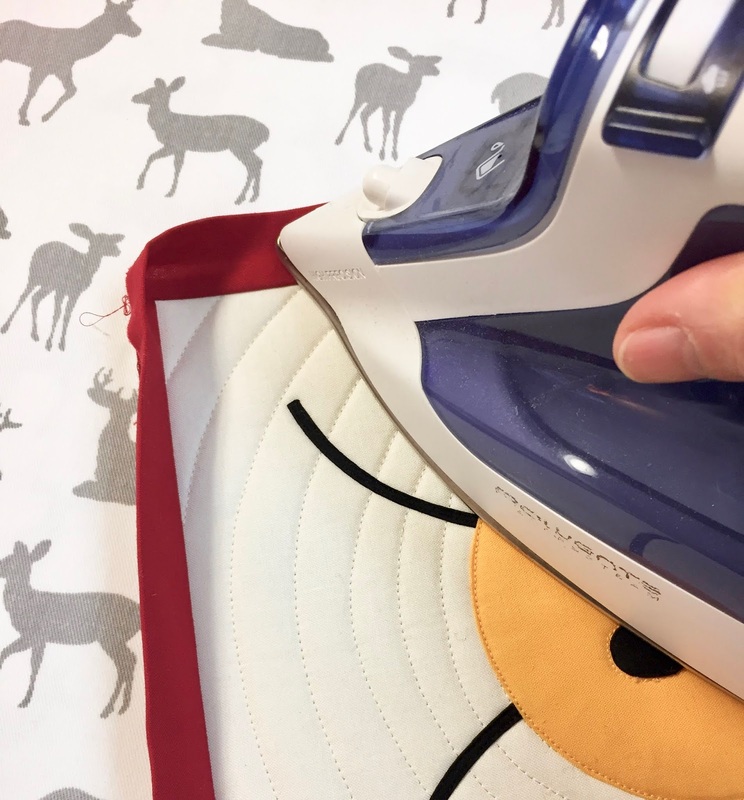 I haven't tried single binding, but looks like it would be great on small quilts. Thanks for the tute! Great tute! Thank you. I do double bindings, because that's what I was taught, but they never made complete sense to me. 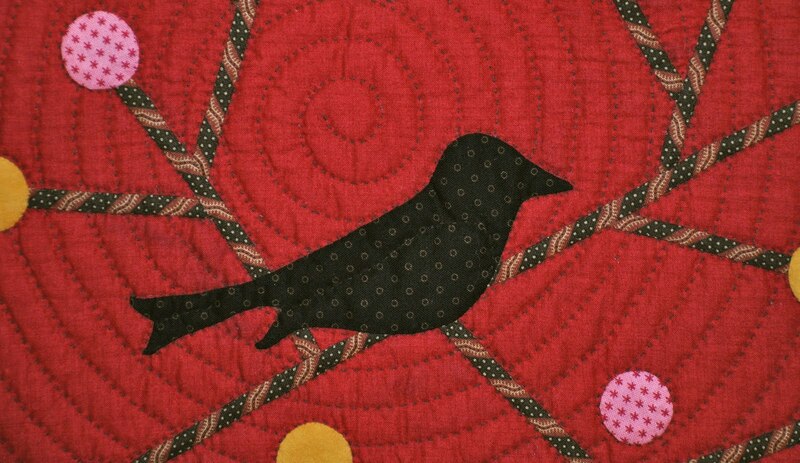 I'll try this on a small quilt someday. Looks like a great way to bind a quilt Barb -- thanks for the tutorial. I guess you can't say no one was harmed in the making of this tutorial -- your dead doll says otherwise LOL. 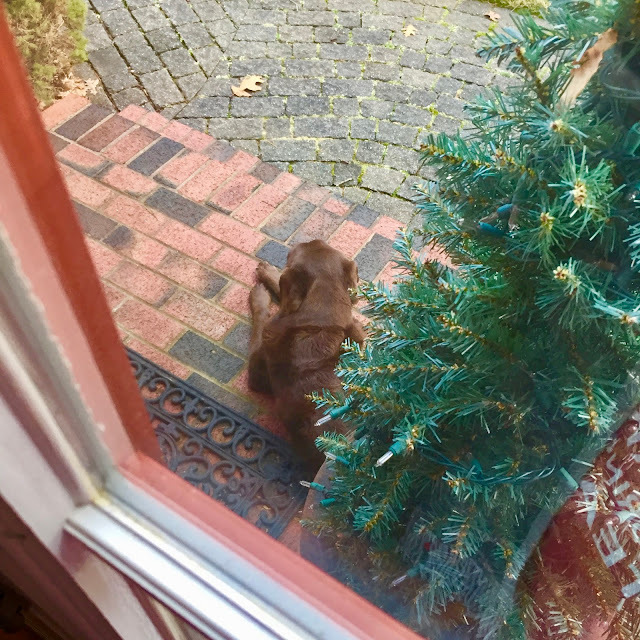 And tell Coco that the snow is west of you -- all the way across the country!!! Great tutorial! I have never seen the binding ended on the corner... very cool!